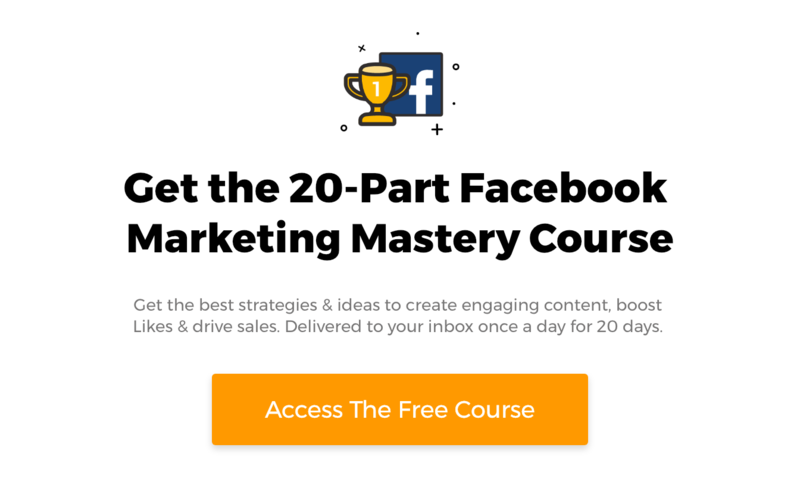 Are you constantly looking for great, engaging Facebook content?? If you’re a good marketer, and you’ve done your marketing planning, you know your content creation gets a little easier. To be a good marketer, you really do need to go through your business goals and objectives, know about your target market (and if you’re really connecting with your consumer, you’ll have made target market personas), and have a good idea of a content strategy, with themes like lifestyles, products, and news. You can even make a monthly schedule with general ideas for what you’ll be posting about to best engage your Fans. Once you’ve got your strategy in place, the daily content and creative part comes into play. Where do you go to find those super engaging posts? How do you find inspiration for your Facebook content? In this article, I share my top 12 tips and secrets to finding engaging Facebook content. Listen to your customer, find out what they want, and provide it to them. Yeah, that’s kind of marketing 101 in a nutshell, but it works - even when you’re looking for Facebook content. Check your Facebook customer posts and comments, check your customer email, check your Twitter mentions. What are your customers asking you, what are they commenting on and what are they posting? Use these as a source of inspiration - they are your target market after all. Make Facebook posts answering their questions (briefly), or addressing topics your Fans are commenting on. 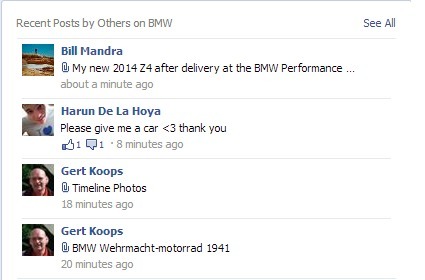 BMW encourages this, and caters to the desire of seeing their driving machines. 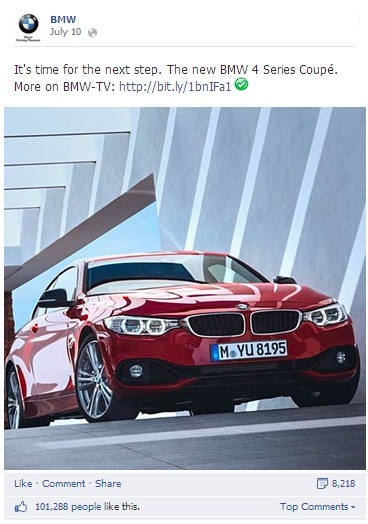 The BMW Facebook posts are pretty much splattered with well photographed images of their cars. Another great way to find engaging Facebook content is to watch your competition. Make a list of 5-20 of your competitors, check out their Facebook Pages on a regular basis. You can try to be like them, and post similar content to their most popular posts. Make your posts slightly different, keeping your company brand and consumer in mind. Or, take note of what they’re posting and how well their marketing themes are in engaging customers - and then do something different. 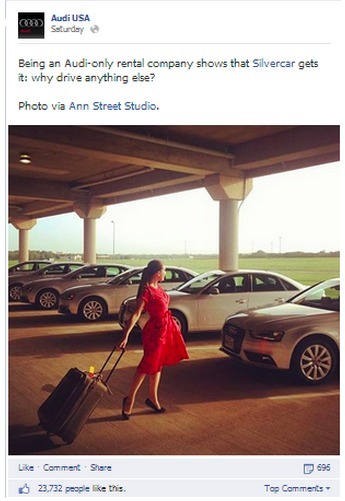 Audi often takes a slightly different approach, posting more day to day lifestyle type images. Make a list of brand, product and lifestyle related hashtags. Monitor these keywords on your social sites. Track the hashtags on Pinterest, Twitter, Tumblr, Instagram, and now on Facebook too. On Pinterest, for example, you can find some great sources of inspiration for images of lifestyle posts. 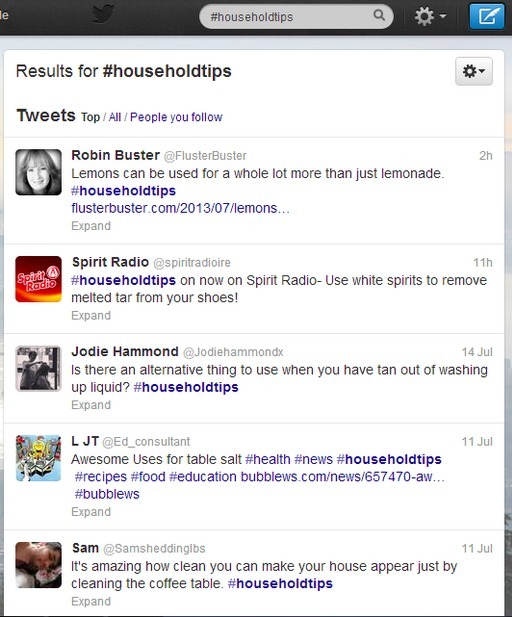 If your Facebook strategy includes, say, posts about household tips - search and monitor Pinterest for great ideas on #householdtips, #householdtricks and #houseworktips. Tip: Here’s a really great way to get a collection of Pinterest posts for future Facebook posts: set up a secret Pinterest Board, and pin your favourite hashtag searches to it. That way, when you are needing a Facebook post right away and just lack the inspiration in that moment (hey, we’ve all been there!) - go to your secret Pin Board, and you’ve got tons to work with! When you post ideas from Pinterest, make sure you source the original posting - including this can make your post a little more friendly and shareable. Use the examples from Twitter, and include your own image, to make it more original. In addition to tracking hashtags on your favourite social sites, follow the people and brands that post inspiring updates about topics related to your business. These brands could include your competitors, your customers, and even potential business partners. Tip: If your source is your customer or potential friendly partner, a good practice is to mention them in your post, or at least mention them when you are cross-promoting your Facebook post. I’d highly recommend using this practice whether it’s for Facebook Post inspiration, or any other type of Facebook content. Make a list of 10-20 industry specific blog posts. Check them out, by reading a few of their posts and see what they do as a company. If the posts fit with your Facebook content strategy, subscribe to their blogs. I’d recommend using a reader feed. This keeps your email less clogged, and you can organize your reading material a lot better in a cloud-based reader than through an emailed one. Yes, I’m still missing Google Reader (which closed July 1) a bit, but fortunately there’s a lot of great alternatives. Check out, for example, feedly. It’s probably the most popular reader now. You get lots of user-friendly flexibility to organize and format your reading too. A few other readers include: DiggReader, NewsBlur and newsvibe. Scan your reader on a daily basis to keep up-to-date on the latest news in your business niche, and for sources of inspiration for your Facebook content. Find inspiration through social sites that cater to your business niche. You likely know your niche social sites for your industry (more than I do). Stay connected with them, and use them for Facebook page inspiration. A few more general niche sites (is that really a term these days?) include the classics like Reddit, and newer sharing sites like Snapguide, slideshare and prezi. Use Reddit, for example, to search for lifestyle tips, images, and animals. It’s particularly relevant if your market tends to be on the tech side. Use Snapguide to search for lifestyle how-to’s and tips. I’ve got to admit, Snapguide is quickly becoming a favourite of mine. It’s full of really simple, visual how-to guides on everything from ‘how to smoke bbq on a gas grill’ to ‘how to create a podcast from your iphone’. Find ideas and inspiration from these particular sites. 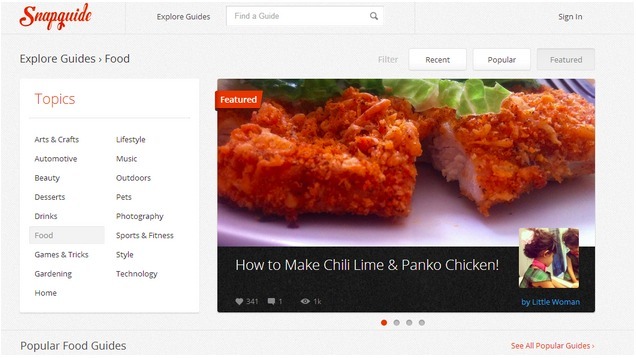 Explore niche social sites in your industry too. Again, you can always include the source in your Facebook post, to give a shout out to the original poster. Contests and social promotions are an amazing way to increase engagement on your Facebook Page - and they give you tons of content options. Whether you have a big budget for prizes, or you have little to no budget for prizes, contests make great posts. Contests, coupons and sweepstakes also generate tons of engagement for your Page - and your business. I’ve seen all kinds of effective methods for getting more interaction this way. 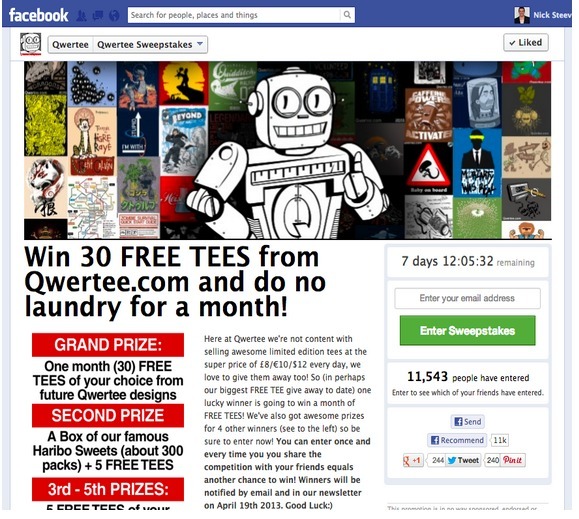 Some companies use sweepstakes on a weekly basis, to get lots of interest in their Page. Some companies use engaging contests like vote contests, essay contests and even video contests to gain lots of shares, likes and comments on their Page. If you are running contests to increase engagement (and market your business), it’s best to run them frequently and consistently. Another great tip to finding engaging content is to add meme’s to your Facebook updates. Meme’s are super popular, and can get you lots of likes, shares and comments. They are numerous sites that you can use to make your own meme. You can make them in a matter of minutes. Many of these sites are free, and shareable. That means if you’re really at a loss for creative posting - check out some of the meme’s already made. Share them on your Facebook page. 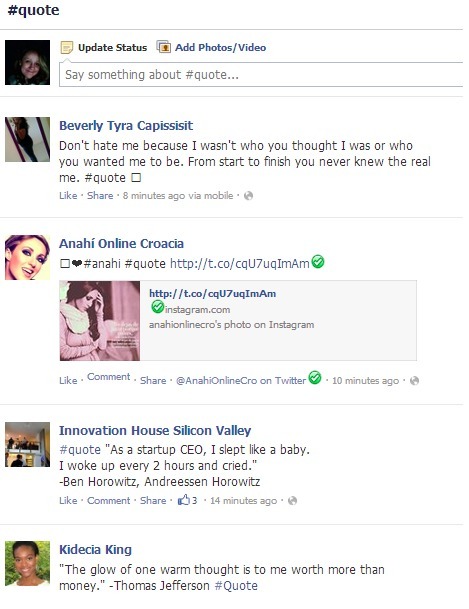 Inspiring quotes are very engaging content, too. You can add them to a meme, another image, or just post them as a plain quote. You can vary your hashtag search to get more specific quotes, like #funny #inspiring or #happy. Use this technique on Twitter too, and you’ll get tons of quotes to inspire you. Images are some of the most shared content on Facebook. In fact, they get 53% more likes than the average post, and 104% more comments than the non-imaged update. So where do you find great images? 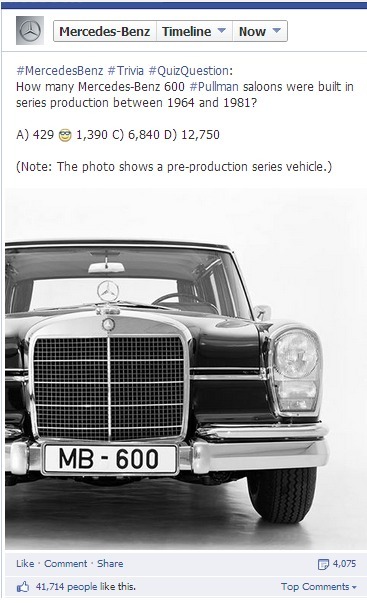 If you don’t have an internal bank of images for your business Facebook page, don’t panic. There are many really simple ways to get them that you can use for your updates. A really simple, and effective way to get visuals is to use Google Images. Let Google crawl the internet to find you the perfect jpeg or png for your updates. Try out a variety of searches if at first you don’t find the visual you need. You could also search through Flickr Creative Commons (some of the copyright licenses let you use the images for business purposes). There are also sites like 9gag that have a myriad of funny images - including pre-made meme’s. What do you think? What tips do you use to create the most engaging Facebook content for your business page? Share them.